In a recent review, I mentioned about mighty Australian tomes. I was lucky again to receive a further one, A Century of Cricket Tests, which was again too big for the postman to deliver through my letterbox but it was very much worth the visit to the local branch to collect it. 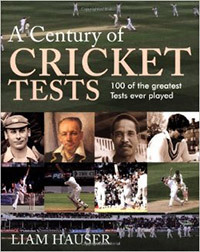 Again, like another New Holland publication, The 100 Greatest Cricketers, I admire anyone bringing out a book on a selection of Cricket Tests as, again, everyone has different views. This one, though, as its title suggests, goes on to depict itself as 100 of the greatest Tests ever played which is slightly different. As many know, Test cricket is the pinnacle of the sport: a first day collapse need not suggest impending doom for that team or for spectators with tickets for the last day or two so, whilst many of the Tests listed ended in close finishes with one side winning and the other losing, there are some famous draws. Who can forget the Timeless Test which South Africa might have lost in 1939 after ten days because England’s ship had to depart?